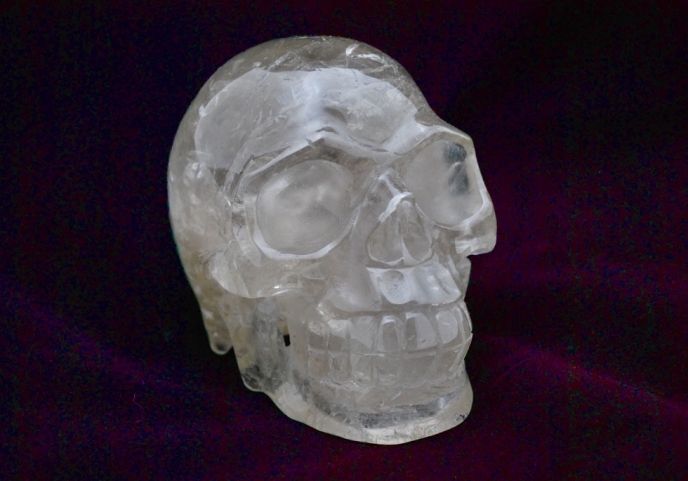 First take the skull in your hands, you are going to clear unwanted energies from the matrix of the skull. This is easy, it is a question of forming a series of commands in your mind and then passing them to the skull. This is done with intention, remember thoughts are living things, so you pass on the thought to the skull! The commands are: You will be de-programmed, clear clear clear (say this 3 times). Then command: You will channel Divine Light, You will be self cleansing (again 3 times). Holding your skull over your heart centre with both hands…relax…inhale… feel you heart chakra activated, if you don’t feel this again command the activation by saying I AM THAT I AM LOVE (3 times). Inhale slowly, and as you exhale, sink even deeper the energy to flow—down into the legs, through the legs and into the feet. Feel your feet. Activate you earth star chakra: activate (3 times). Feel the skull in your hands. Feel the gentle rhythm of the skull, and slowly, with the connection you feel towards the Spirit of this being, inhale through your mouth the greater Self of the skull. Exhale into earth star increasing your connection with the Mother Earth, giving back and energizing the Earth with Divine Love. Move consciously through the center of the skull. It is as though the spiral of the skull and the spiraling essence of your beingness are beginning to pulse together. Within this rhythm you are merging your consciousness with your skull, and the energies that work through it. Gently open your inner sight, centred in your 3rd eye, as you move through the landscapes of crystalline light. Allow your heart to receive the warmth filled with this glowing essence. Feel your cells receiving the Light of the 13 Ancient Skulls. Experience your connection with the energy of your skull. From this union, feel the freedom and expression of the beings that work through your skull, ask them to communicate with you in a way you can understand, this is different for all beings. You have now come HOME!